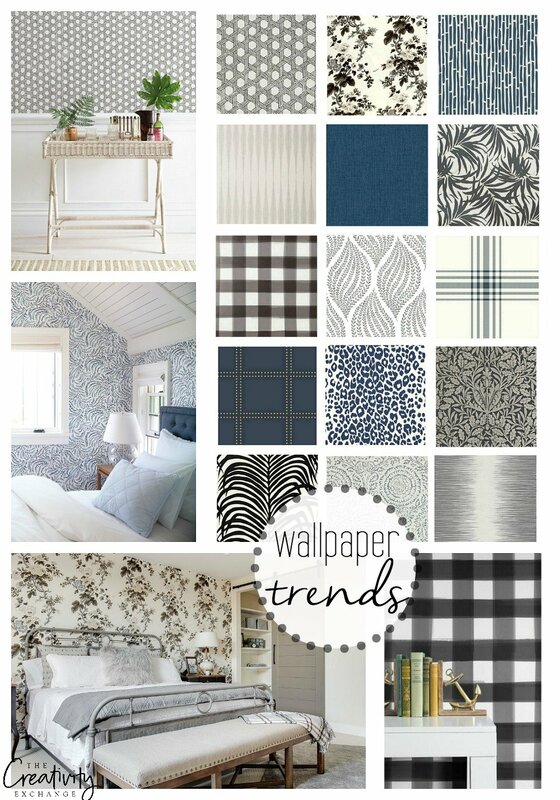 Wallpaper is making a comeback in a big way and I’m really excited about all the gorgeous prints, textures and colors out right now. 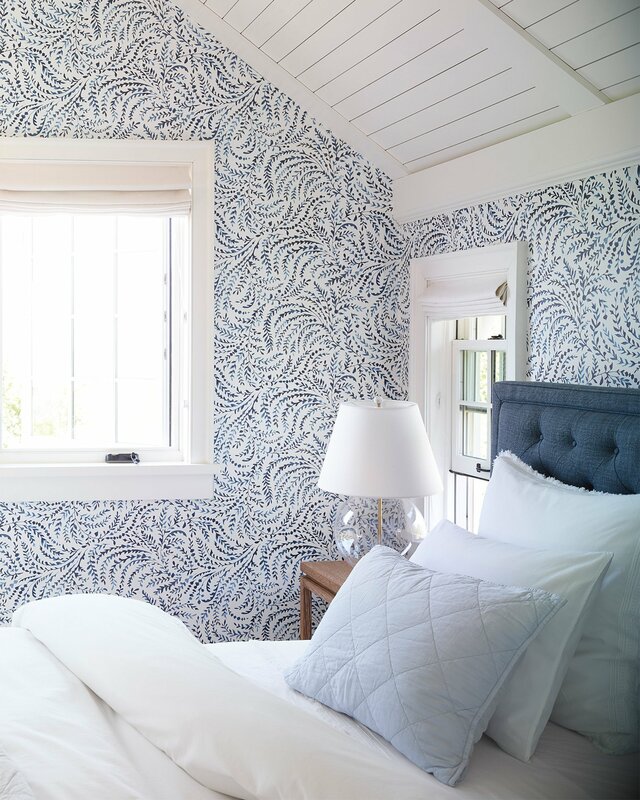 Today for Moody Monday, I wanted to do something just a little different and share some beautiful wallpaper trends and creative ways to use these papers throughout your home. 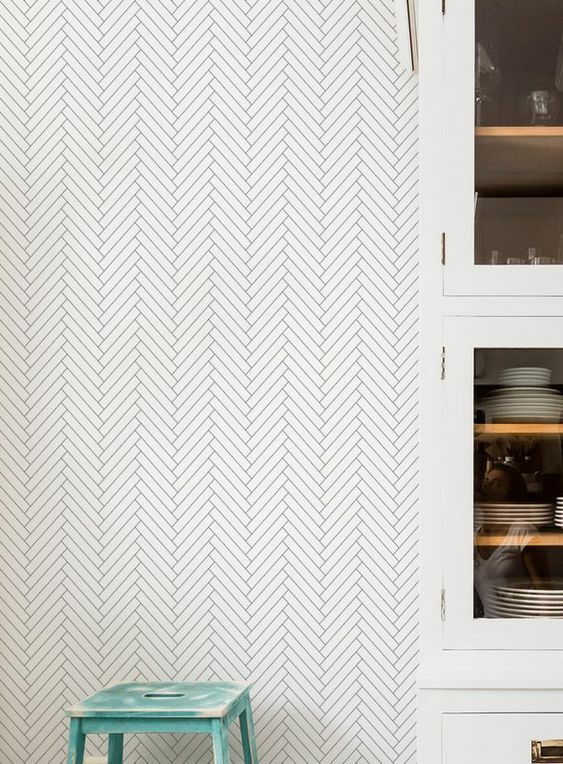 I really love the way wallpapers are being used today sparingly on one accent wall, in the back of cabinetry shelving and small spaces like powder rooms. I have never been a fan of wallpaper in larger spaces or whole rooms because it takes me back to my 90’s kitchen when I swore I would never use wallpaper again. 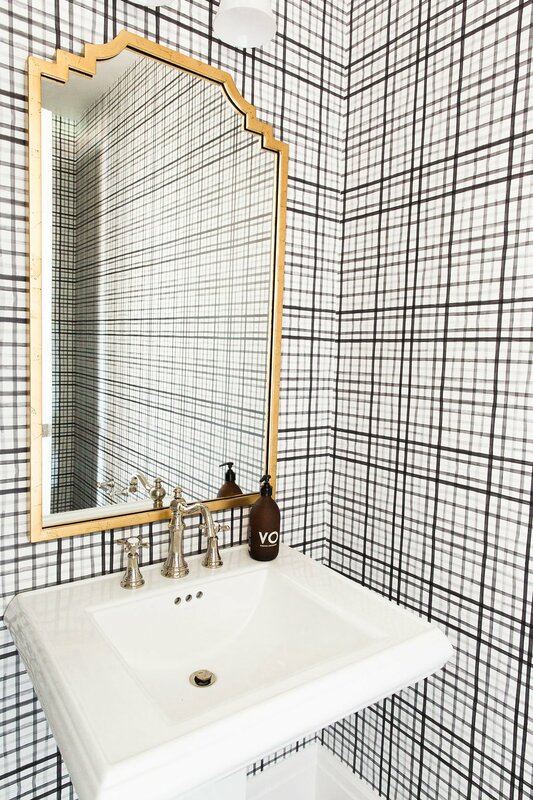 The good news is, times have changed and wallpaper used creatively in these strategic spaces can be absolutely amazing! 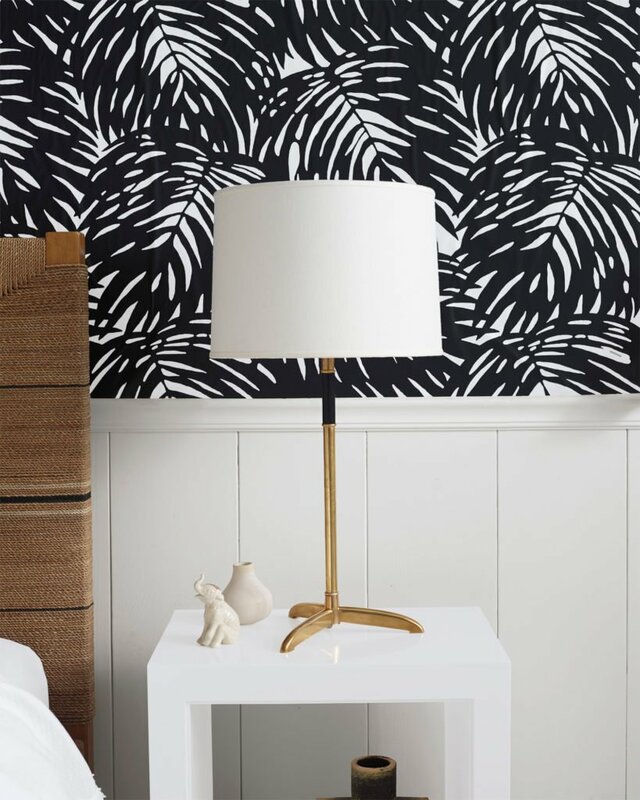 One of the biggest trends that we’ve seen this last year when it comes to wallpaper are bold palm and tropical prints. 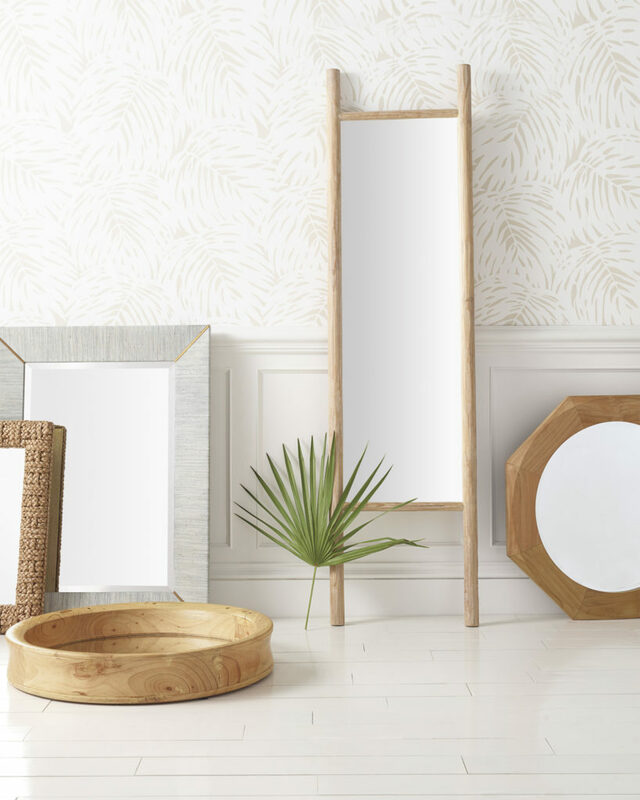 I love anything that gives me a tropical vibe and these these papers are perfect on an accent wall, mixed with wainscoting and small powder rooms for a little extra drama. 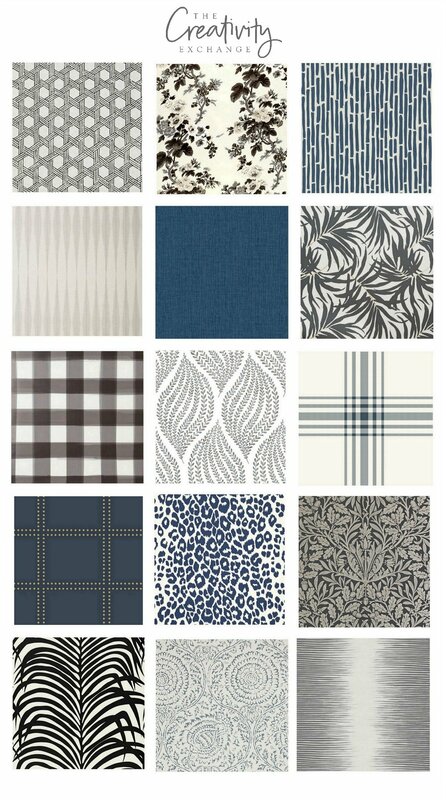 The great news is that when it comes to wallpaper today, you can usually get a pattern in several different color ways. So if you love a bold palm print but want to keep it subtle, consider a light gray or tan color way in the same print. I also love the Serena and Lily navy color way in this same palm print, which is so elegant but fun! 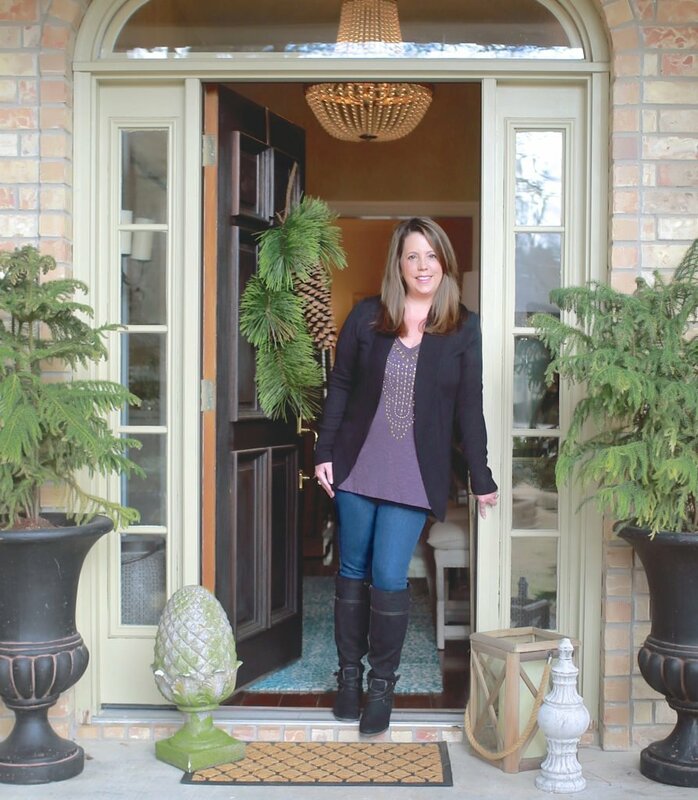 This type of print is a great way to make a small entryway all stand out in a beautiful way. A modern take on the traditional paisley patterns of years past are back in fabric and wallpaper and I have really loved some of the paper options right now like this indigo and white modern paisley design that I think is perfect for an accent wall. By the way it comes in black as well. 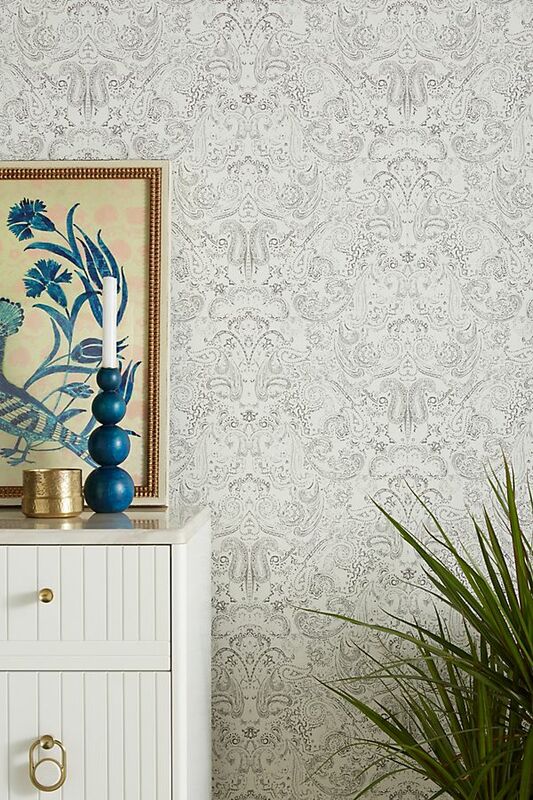 It’s so convenient that some our favorite home stores like Serena and Lily, Pottery Barn and Anthropologie are now designing their own papers or partnering with wallpaper manufacturers. 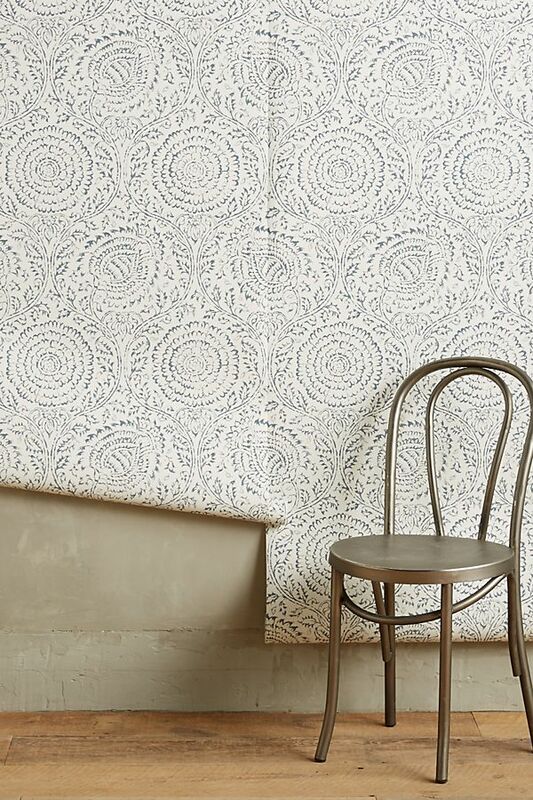 I am also really loving this distressed paisley paper from Anthropologie below and think it would be stunning on a bedroom accent wall. Paisley prints are a great compromise if you want a paper for that pop of color and design but don’t want to go to bold. Floral papers are also back in a big way but don’t panic, these are not those 80’s gaudy floral papers that make us cringe when we think back. 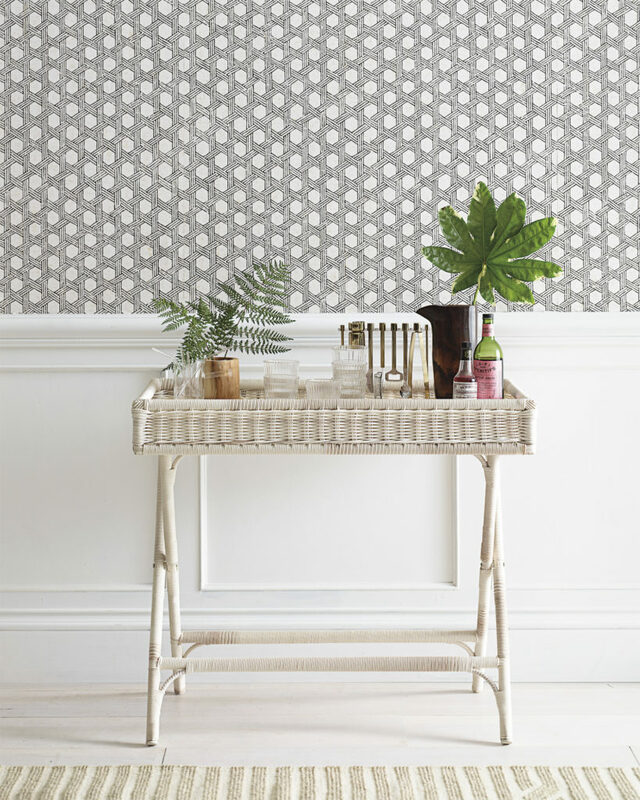 Today’s floral papers are smaller prints and more modern. 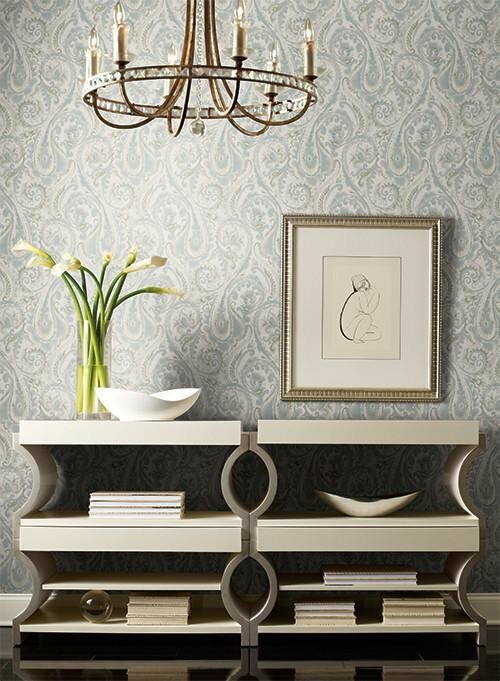 This Serena and Lily Priano wallpaper below is one of my favorites and is really popular right now with designers because it’s such a beautiful pop of color and pattern (it comes in four other colors). 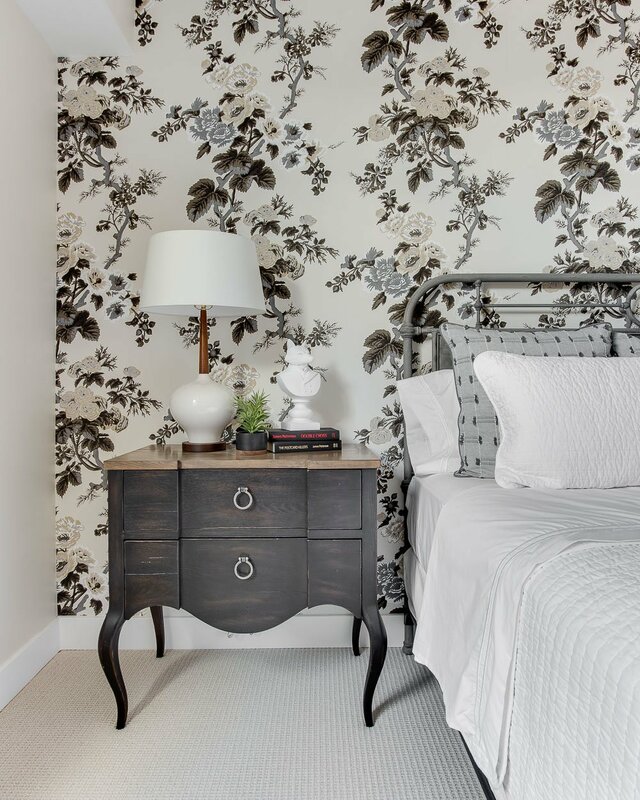 If you’re looking for a little bolder floral paper for an accent wall, this Schumacher paper below is one of my favorites. 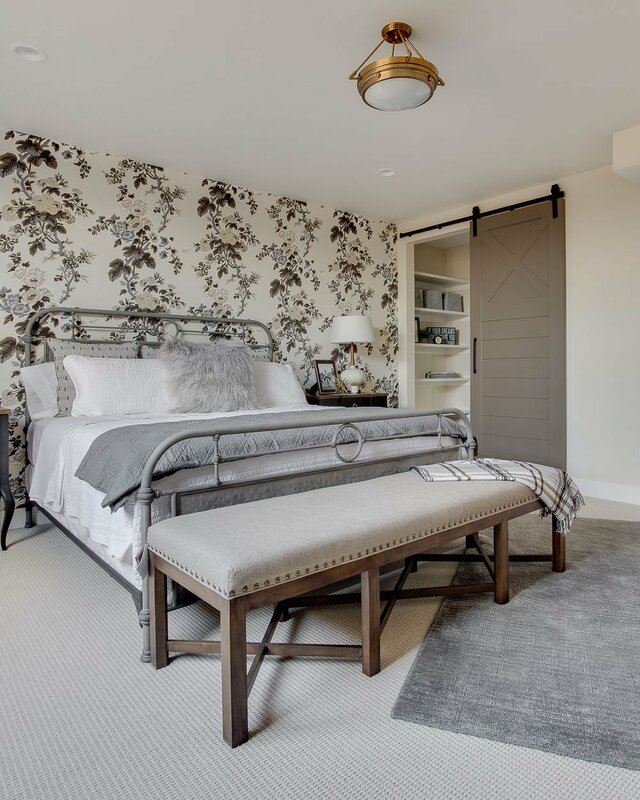 I loved how Simons Design Studio used it on an accent wall in this amazing home I toured last year. 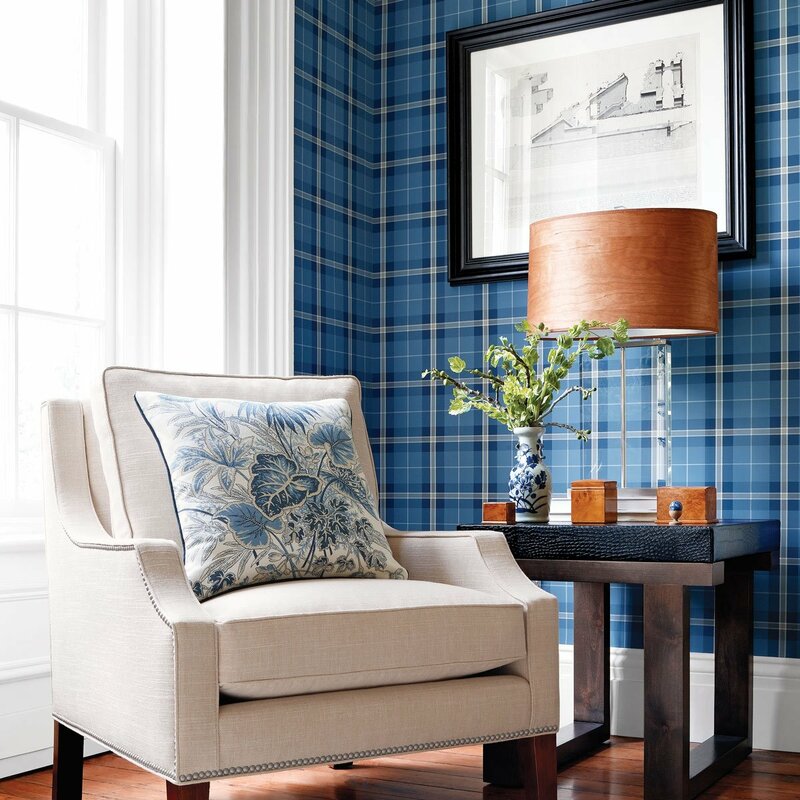 I personally think we’re going to be seeing a lot of plaid fabrics and wallpaper this year (ala Ralph Lauren in the 90’s). 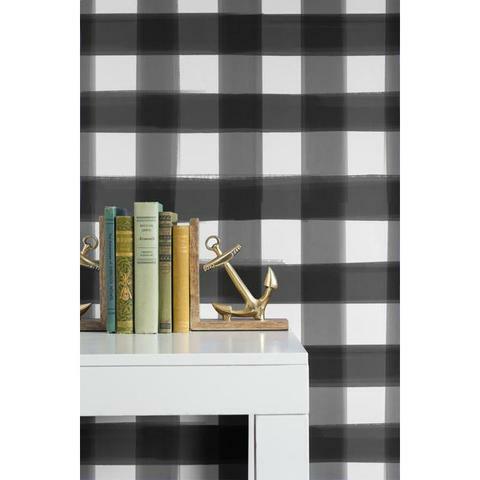 Of course, buffalo plaid prints have been hugely popular the last couple of years and it’s so fun in a wallpaper. I’m not sure I’ll ever tire of buffalo plaid! I think we’re going to be seeing a lot of plaids this next year used in papers with a more modern twist. Geometric prints are still really popular in papers and there are SOOOO many beautiful geometric prints out there right now that it’s so overwhelming and hard to pick one. One of my favorite geometric paper that I have recommended a couple times to clients is the feather paper from Serena and Lily that comes in five colors. It’s really so perfect for an accent wall and I really love for inside back of media cabinetry. Just perfect! A less expensive but similar choice (especially for use in cabinetry) is a peel-and-stick alternative that I found. Peel-and-stick is a great choice if you live in an apartment or rent a home and cannot make permanent changes. 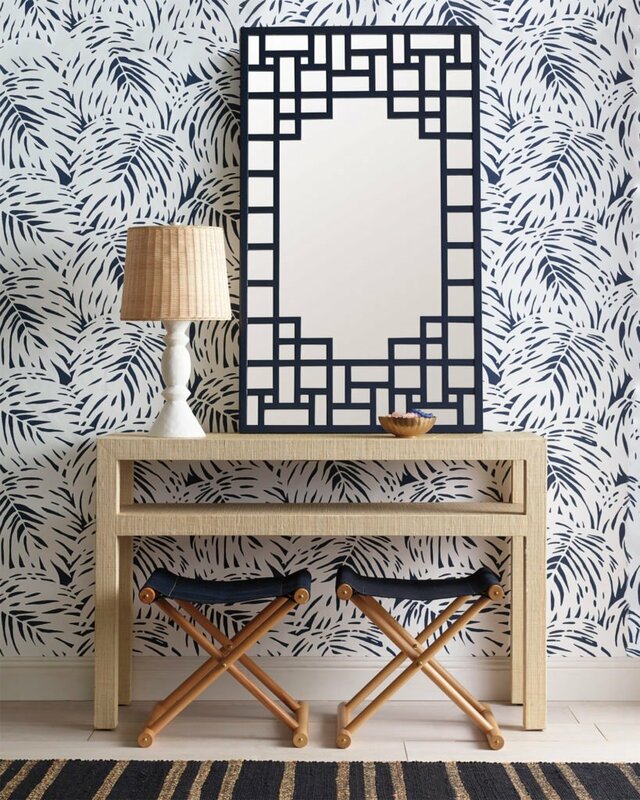 Geometric prints like bamboo and cane patterns are a great option as well. Grasscloth papers are my favorite! They are also going to continue to trend in 2019 for a great reason because they can add such rich color and texture to a wall. 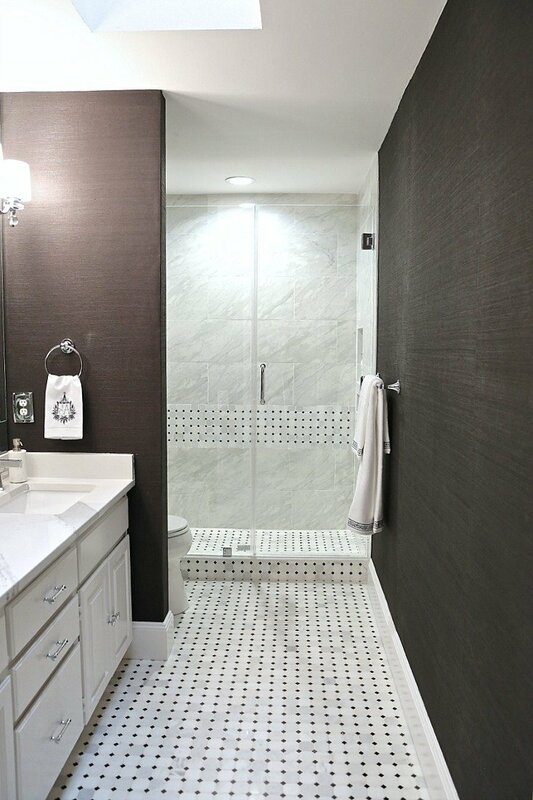 Last year, I covered my guest bathroom walls with black grasscloth and I just love it! 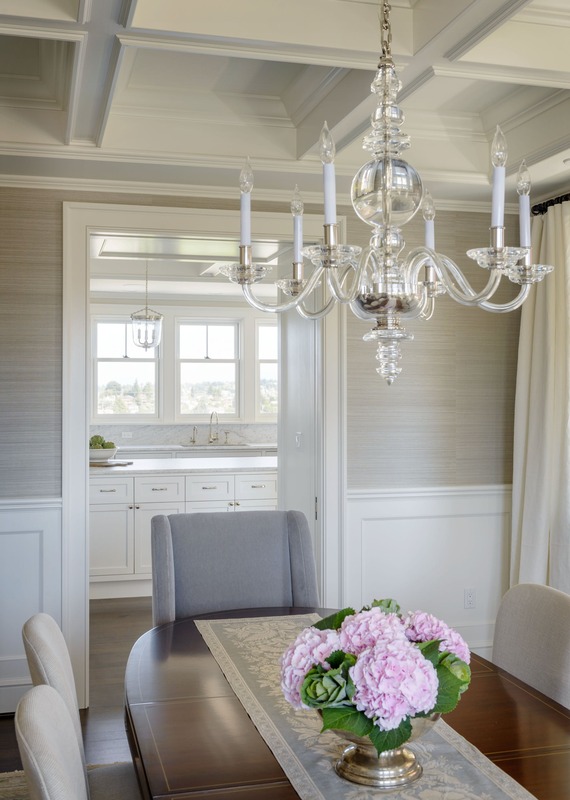 Grasscloth gives a color and depth unlike any paint or wallpaper. I could go on and on sharing my favorite wallpapers right now but this post is pretty long already. So, I pulled together my favorites for you to see and hopefully there’s one or two here that inspire you! The links to the sources are directly below the image. If you want to see more home design trends for 2019, I pulled together all my favorites here. Also, if you want to look through my past Moody Mondays, you can find them here. Cindy – it’s been years since I’ve done any wall paper . But your examples make me rethink my thoughts on wall paper . Do u know if the wall paper used now is easy to remove ?? I love wallpaper! I have a beautiful English paper in my Tudor kitchen that I will hate replacing one day. I also love the new papers! Cindy, I really enjoy reading your blog and looking at all of the great ideas you have. Off topic I have to tell you that I make your holiday cinnamon cayenne and brown sugar nuts for the holidays every year since I first read about it on your blog. I use all kinds of nuts when I make it. My family is coming by today and I just finished a batch. It’s now a tradition in our family. Thanks again and keep those ideas coming. Happy New Year ! Hi Cyndy! 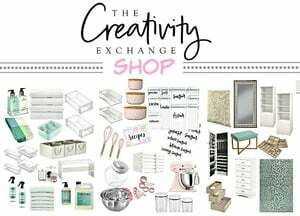 I’ve been reading “The Creativity Exchange” for several years now, and I’ve always found your decorating ideas, ‘how-to’ lessons and reviews of the latest trends & products SO GREAT! 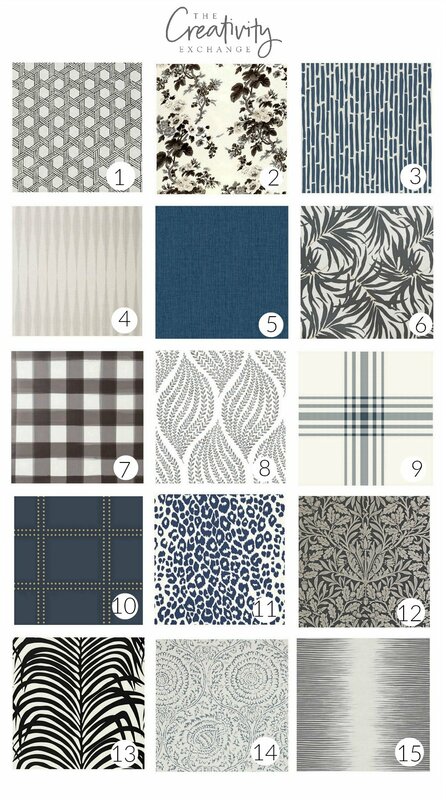 I just finished reading your article on wallpaper trends, and am excited about trying some in my entryway. Perhaps I will share my results. Sincerely, Cece S.